by Grahame L. Newnham B.Sc. Mechanised musical entertainment in bars and cafes has always proved popular. Entrepreneurs over the years have introduced coin operated music boxes, mechanical organs and player pianos. 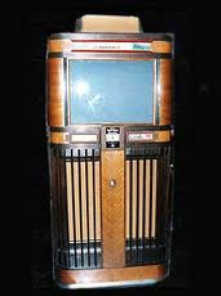 Once recording and reproduction of actual artists performing became feasible, the 'juke box' was born. Just a coin in the slot and a choice of music from actual entertainers was possible. Advances in technology meant that the next stage was to add synchronised moving pictures to the music. Edison's interest in moving pictures was supposed to have originated from his desire to provide his Kinetoscopes (coin operated movie film viewers) with picture and sound, but lack of suitable amplification and accurate synchronisation precluded much success in this direction. (An Edison Kinetophone was announced in Spring 1885, but reports suggest that only 45 machines were ever produced.) 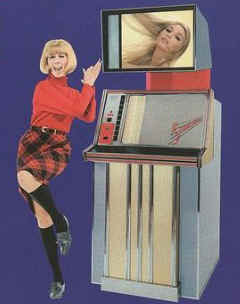 Later attempts to provide combined audio and visual entertainment seem to have had mixed commercial success. 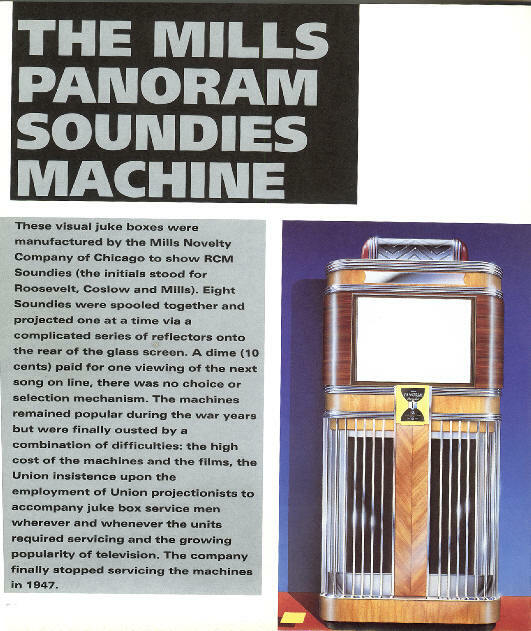 In 1940 the Mills Novelty Company of Chicago introduced the 'Panoram' visual juke box. Three minute black and white 16mm musical shorts were back projected via a series of mirrors onto an 18 x 22 inch ground glass screen mounted on the top front of the unit. The projector unit was a modified RCA 16mm cine projector. Because the short films were held as a continuous 800ft loop, customers could not choose the titles, just getting the next musical clip on the film roll. Cost to exhibitors was 600 US dollars for the equipment, with each reel of 8 music subjects rented for 10 US dollars a week. Mills promised operators a take of over 1000 US dollars a year. The first film releases were produced by the President's son James Roosevelt via Globe Productions. The name 'Soundies' originated from the distribution company Mills set up in 1941 called 'The Soundies Distributing Corporation of America, Inc'. Globe Productions began production in Hollywood, by December 1940 they were also using the Fox-Movietone studios in Manhatten. Unfortunately production ceased in April 1941 when James Roosevelt joined the Marine Corps! Mills quickly formed their own production company for making Soundies: 'Minoco Productions'. Within a year they had formed another: 'RCM Productions' (Roosevelt, songwritwer Sam Coslow and Gordon Mills). Another prolific producer of these Soundies was William Forrest Crouch, a real showman, of 'Filmcraft' whose dominant ingredient in his productions was feminine 'cheesecake'. These and one or two other companies were to produce the bulk of the 1800 odd musical shorts to be distributed over the next 6 years to bars, cafes and roadhouses across the USA and Canada. A new reel of eight subjects was released each week with additional titles at Christmas and New Year. Production costs for the musical shorts was kept to a minimum, few name stars appeared after the first flurry of activity. Soundtracks were pre-recorded (sometimes by other artists!) and lack of rehearsals meant synchronisation was not always perfect. By 1948 Soundies were on their way out. Wartime restrictions, lack of quality and a musicians' union ban had all taken their toll. The 10,000 machines in use in 1943 had dwindled to only 2000 nationwide. 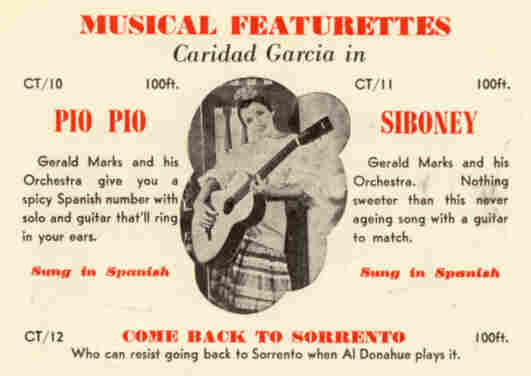 1947 saw the end of the 1940s Soundies era. Castle Films were the first to offer home movie versions in the USA as 16mm reels of three titles - 'Castle Music Albums'. By 1948 copyright passed to Official Films Inc. who marketed them for American TV amd home movie distribution. Incidentally Blackhawk, another well known American home movie film distributor bought up all the actual 16mm soundie prints for resale to collectors - however, beware - these all have reveresed picture if run in an ordinary 16mm sound projector. In the UK the 100ft Pictoreel Films Inc. shorts are examples of these Soundies and were available on 16mm optical sound from Frank Jessop and on 9.5mm optical sound from Pathéscope Ltd., who released 24 popular titles during 1951 and 1952. 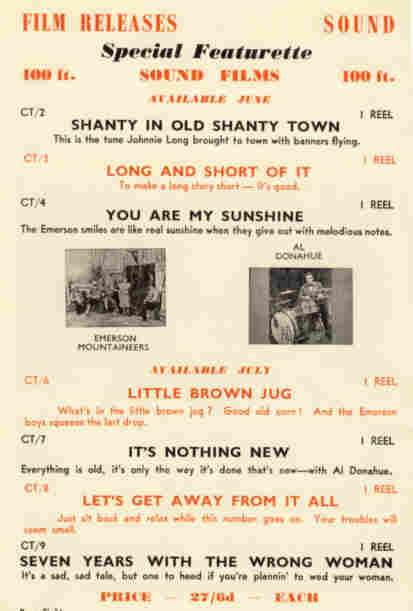 With 9.5mm Pathéscope catalogue numbers CT.1 to CT.24, they feature the Johnny Long (including "Shanty In Old Shanty Town"), Art Dixon, Al Donahue, Larry Clinton and Gerald Marks Orchestras plus The Emmerson Mountaineers. First announced in the April/May 1951 Pathéscope Monthly, details are also in the 1952 & 1953 Pathéscope Film Catalogues, later 1951 and 1952 Pathéscope Monthly magazines and of course in Maurice Trace's superb complete 9.5mm Sound Catalogue. These 24 'soundie' 100ft musical shorts continued to be available on 9.5mm optical sound until 1955. All the 9.5mm 'soundies' titles are listed lower down this page, together with a few You Tube links to actually view these short 9.5mm optical sound films! 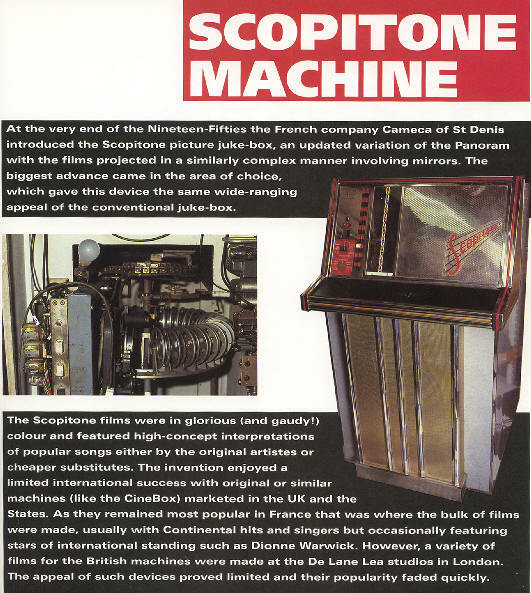 In 1960 with more modern equipment designs, from France came the 'Scopitone' made by Cameca on Boulevard Saint Denis in Courbevoie near Paris, and from Italy the 'Cinebox'. 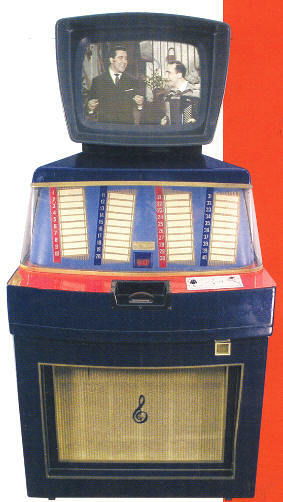 These film juke boxes used 16mm colour film shorts, Scopitone with magnetic sound tracks, Cinebox with optical. Each machine held a selection of 40 titles. Again a back projection system was used , meaning the film prints were reversed to normal 16mm standards. At least with these machines, the customer could atcually choose the title of the musical short they wanted to view! In the Cinebox, made in Rome by Ottico Meccanica Italiana, the 24fps optical track was scanned about 20 frames ahead of the picture head, meaning prints have not only reversed picture but are also out-of-sync. when run on standard 16mm optical sound projectors. The TV size picture was produced from a 12 volt 100 watt lamp via a rotating prism arrangement. The machines looked quite impressive, and quality was excellent, the cost however was in the region of £1400. Although initial music subjects seem to have been imported from Europe, by 1961 most UK material also originated in the UK, many produced in London by De Lane Lea Ltd. Artists included Acker Bilk, Vince Hill, The Raindrops and Eden Kane, whilst glamour was provided by the Boscoe Holder dancers and Fay Craig. The machines made a brief appearance in the USA, (mostly the Scopitone), where some 16mm prints were produced in Technicolor. Debbie Reynolds was involved with the American film production company, hence we find her appearing in a number of American titles. 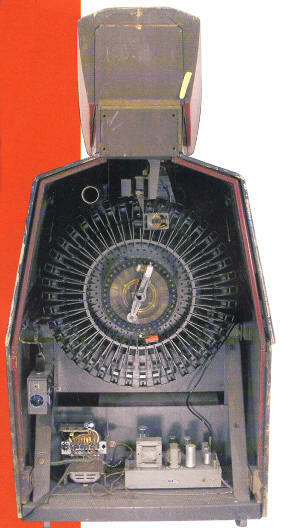 Later some machines were modified to run longer 40 minute films (a choice of 5 titles) and were used on cruise ships. Unfortunately the machines were rather complicated and a film break could cause havoc! With the unreliability, copyright complications and a reducing revenue (the cost per play at the time was a shilling (5p) twice the price of an ordinary audio juke box), the distribution company in the UK - Filmvision Ltd retired from the scene in 1964. Larry Pearce of LGP (Cine) obtained hundreds of the ex-juke box 16mm prints and reperforated them to 9.5mm optical sound - just over half the sound track was retained, still meaning a bit of the opposite edge of the picture was lost; although the picture was the correct way round, the sound sync. was of course still wrong, although this doesn't always notice except on vocals. These little musical shorts provided a spot of colour, punchy sound and something modern for 9.5mm film shows! Sadly today the colour (Eastman I guess) is generally washed out, but they still make interesting viewing. Incidentally about a dozen of these 'Cinebox' titles were released in the UK on std.8mm magnetic sound by Heritage Films (with correct sound sync!) in both colour and black & white versions. So 9.5mm optical sound films can provide yet another slice of history with good examples of the past attempts to provide synchronised music and pictures at the drop of a coin. "The Soundies Distrubuting Corporation of America" published in the USA by McFarland. 9.5mm 'SOUNDIES' RELEASED IN THE UK BY PATHÉSCOPE LTD.
1. Title card reads "Watcha Know, Joe" although song is generally known as "Whatcha Know, Joe?" the Maurice Trace 9.5mm Sound Film Catalogue and the book mentioned above. as do the actual film titles and numbers etc. actually filmed for Phonovue Productions (a rival to the Panoram) in 1941.
of: CT.19 "Watcha Know Joe" and CT.20 "Dipsy Doodle"